It seems the Good News:Bad News ratio for NASA’s Constellation Project is getting smaller with every news item that is posted. This week, the good news is: NASA may have solved the Ares vibration problem, but the bad news is: NASA has just released images of the failed Orion parachute test, the Constellation spacesuits will need to be produced by a different manufacturer and now we have concerns for the sub-standard infrastructure at Kennedy Space Center. So this week’s ratio so far is 1:3… not good. OK, that wasn’t a very scientific statistical analysis, but it is clear that the Constellation is off to a bumpy start. You could argue that bad news is more likely to make the headlines than good news, but the complications for NASA are becoming problematic and many are concerned that the gap between Shuttle decommissioning and Constellation launch could widen. This issue is now cropping up in the US Presidential race, with both frontrunning candidates (Obama and McCain) making promises for increased space agency funding. So what is wrong with Kennedy’s crawlerway? The combined weight of NASA’s Ares V cargo launch vehicle, its mobile launcher and Constellation crawler-transporter may be too heavy for it to support. After all, the 6.8 km (4.2 mile) crawlerway was built with the Apollo program’s Saturn V in mind, 40 years ago. Fortunately it didn’t require an upgrade when transporting the Shuttle, but the difference in weight from the Shuttle to Ares V is stark. 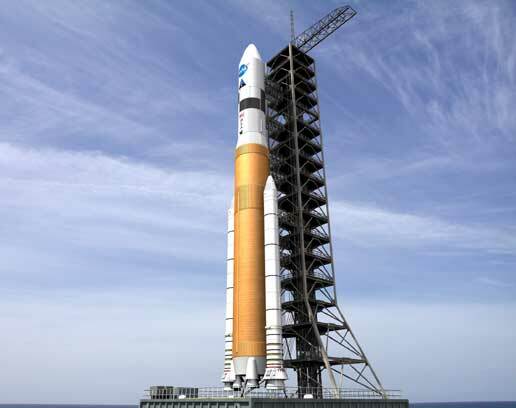 The fully-laden Shuttle (plus crawler and empty external tank) has a mass of 7.7 million kg (16.9 million lb); the fully-laden Ares V could weigh as much as 10.9 million kg (24 million lb). This mass increase could cause significant damage to the crawlerway and, ultimately, damage to Ares V should the existing road be used. The crawlerway is designed as two 12 metre-wide lanes, separated by 15 metres. It has a surface of the road has 20 cm of river gravel on top of 90 cm of compacted limerock. Under that is two layers of “select fill” 1.1 metres deep. “Given the projected weight of the Ares V vehicle, mobile launcher and transporter, the total weight is about 33% higher than the crawlerway has ever supported there is a possibility that the crawlerway could fail to support the load, resulting in severe impacts to the Constellation programme.” – Constellation vertical integration element risk assessment. Road to space blocked by inability to make roads… almost poetic. I’m not buying the idea that it costs billions of dollars to upgrade this road. Sounds more like a general upgrade of the launch facility thats going to incorporate more than just a gravel path. Maybe they’d want to retire the crawler in favor of a rail system or something more able to deal with the weight. Either way its an unavoidable problem if NASA wants to launch larger payloads. Maybe our new found political friends will give up on shuttle flight extensions to pave the way for constellation. /I’ll be here all week! Try the veal. What proof do you have that it will cost billions (of dollars, I guess you mean) to upgrade the crawlerway, if it’s even necessary? There’s no pricing estimates in your piece or the Flight International article. Prove or retract. Either way, without a budget increase it seems the road to success for Constellation will crumble under it’s own weight. Whoever drew up the plans for this moonshot seems to me to be a Lunatic……… yeah, I got nothing…..
Man, why does it seem that despite the leaps and bounds by which our understanding of technology has grown, it is actaully getting exponentially more difficult to actually move forward with space exploration! How infeasible is it to create a smaller craft using prefab parts and just fly more of them? If bigger is vastly more expensive and countries like Iran actually have legitimate space faring ambitions; why is the U.S. finding it so difficult? We actually have the resources *and* the experience these issues just make us seem inept. If I understand correctly, probably not. The Jupiter weights less than Ares(?) but still doubles the shuttle. Problem I see with Jupiter is its cutting payload capabilities for something that can be assembled in less time. For varying missions You still need a crew ship, and you’ll still need a super heavy launcher. If you want to mass produce something, do the orion, as all trips start in low earth orbit. From there you can go to a space station or pickup a moon lander module, mars module, space lab module, or even make a giant workstation with clamshell doors to act as a satellite service module. I thin in this case two rockets may add up to be cheaper than one. What I would wonder is if there are other pads that can support the ares… or if this is the biggest thing going? If so, it might be a worthwhile upgrade for a nation that wants to put heavy things in orbit. Another chicken little story about Ares. Anyone would think that people are out to find every possible means to blacken the project. First of all it only might be a problem. Secondly, it will be quite a few years before Ares flies, plenty of time to resurface a roadway. Thirdly, why should a new road way cost billions? Could they not just test the crawler with the same weight in stone or lead so as not to risk damage to the Aries V? You can either spend a million dollars researching a pen that works in space… or… use a pencil. I smell a pricey “pork” project coming up. A former state policeman who was a higher up on the Pennsylvania turnpike informed me that it costs approx. 1 million dollars per mile to resurface and reinforce existing highway. While there’s some debate how much of that money is waste, scaling those numbers up to the needs of a roadway capable of supporting the Ares V would seem to support NASA’s claims. Use rails… that is the funniest thing I’ve heard this week. I needed that laugh, thanks! The best solution would be to re-design the crawler to increase its surface area with the earth and decrease its own weight. However, I doubt there is time to design and build this, and the cost would probably be more than a road rebuild. Unique machinery isn’t cheap. Next would be to somehow modify the current crawler. However, I’m not an expert on it, so I’m not sure it is possible; then the added problem that modifying it will add weight so there is a ratio or saturation point to work with even if you increase contact area. To increase the strength of the road, they need to increase the depth, amount of rock, gravel and limestone used, and perhaps add a few other things to increase flexibility and strength (spattered concrete columns etc). FIrst you would have to dig up what is currently there, and probably add about 4-8 feet of depth. So you would have to dig two trenches, which are over 4 miles long, 15-20 feet wide and 8-12 feet deep. Then fill it up with whatever material you are using; all while dealing with weather. Figure up the cubic meters needed, and call your favorite supplier to get the material cost. Not to mention the transportation/disposal of the old material (some may be reusable), transport and placement of new material, and costs of digging, packing, smoothing, expedited settling, surveying, equipment, fuel, energy and workers. Now you can see it will cost a great deal to simply re-rock. Heh… would be a great question for the Presidential candidates, and any other politician running in November; to see if they would support increased funding for the program, and of course… if so, how would they suggest paying for it? I agree that a billion dollars is a bit on the up side. The upper gravel level is designed to give ( crush and compact) a specific amount that is equal for all areas under the crawler. This helps to keep it level as well as reduce vibrations. For a cost estimate this high, it seems the problem must lie with the under pad. If it gives, then it will be very difficult to estimate by how much it will do so and if it only gives on one side, then the crawler will suddenly look like it is taking a hi speed turn on a NASCAR track. NASA has become a bureaucratic abomination. The next administration needs to go over the manned space flight organization with a microscope and flush out the layers that are preventing good decision-making and project schedule adherence. The Chinese and Russians are making us look like complete fools. The figures I’ve seen say that the Jupiter is 50% cheaper to launch than the Ares. If that’s the case you could still launch humans and any additional cargo you might need on separate rockets and still break even. For LEO it’s a no-brainer, and the same appears to apply for the Moon. Continued expansion of manned space exploration depends on one thing – logistics. If we can’t get a good handle on launch costs, all other considerations are moot. We need cheap and dependable, not gee-wizz. Ask Russia and China. If this continues they’ll wave at us from the Moon and laugh in our faces! I believe NASA should create a high-speed rail system. It would travel at speeds similar to those systems found in China and Japan. The Ares would be attached using bungee-style chords onto a standard crawler. Simply depress the button marked “test technique,” close one eye, turn the head slighly and hold your breath deeply until the device has been catapaulted to the launch pad. The heightened speeds would offset some of the added weight on the aging crawlpad while saving the program valuable time in getting the rocket up and running. Seriously, what would be the issue with using a regular rail system? It’s currently used for the Atlas V, and was used on the Titan IV before it was retired… so it wouldn’t even be new to Kennedy / Canaveral. Probably cheaper to maintain than the crawler / crawlway at that. Now that would add to the cost of getting Constellation started, but if that’s what everyone was worried about then why not just say that? Instead of passing it off as a laughing matter. The old saying, “If it ain’t broke, don’t fix it!” Instead of simply enlarging and “improving”, continue with the Apollo and simply refine and correct any problems there. Major projects should be “prefinanced”. In other words, start the savings account and when you HAVE the money do the project. Combine geologists (Florida is a very”flexible” territory),engineers, scientists(of the rocket programs),architects, et.al.,and have them think into the future. What might be coming up, possible weights and widths needed, transport problems now seen and such. Add half or even just quarter to size and cost of project. Also add at least half again to guesstimated cost. I have to work on a very tight budget myself. I must do this alll the time. Could they? Do I miss something here? I wanted to suggest attaching a Zeppelin to compensate for the heavier load, but looked up the usefull lift of the original Zeppelin and despite its size it was just a little over 100 tons, which would not help a lot. If they decide designing a new transport mean, perhaps they could use a waterway. I guess grabbing a water channel and transport vessel may be cheaper, faster, and simpler than building the mamoth road and the crawler. Besides it it would be easily upgradable, and offering gentler, vibration free, and likely faster transport than using road or rails. This post has good and valuable information, Is nice to see some good articles like this one, thank you.